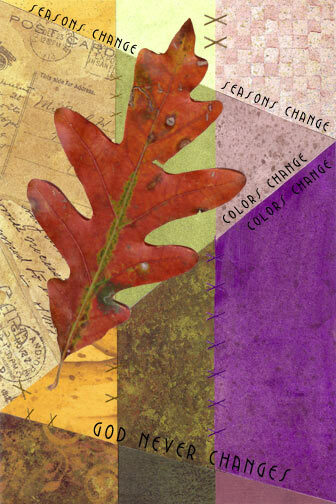 Hi, I'm very new to this and I've been trying to find a method to get tissue paper to look like the purple in the bottom right of your Seasons Change collage (shown above). It is very beautiful and would like to make a piece for my home, but I can't figure out how to do it like that. I've read through your background techniques and they look somewhat similar, just wondering if you would share how you did the purple in that collage. That paper was actually a piece of card stock that had cheap coloring that bled. I got it wet, let it puddle and run, and ironed it back flat after it dried. I see what you mean...it does look like tissue paper, but the only trick here was cheap cheap cheap card stock! I scanned the collage and added the words digitally, so the final result is a mixture of physical and digital work.